In the mood for a good cup of coffee in Cabo? 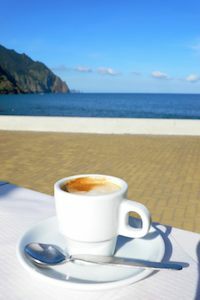 The great thing is that Cabo San Lucas offers familar coffee companies and good local coffee companies. Enjoy your coffee! Cabo Coffee Company – This organic Cabo coffee comapny is family owned. They currently have two locations: The main one is located just blocks from the cruise ship dock, and right across from the Amelia Wilkes Plaza. The other is at Plaza Nautica. The Cabo Coffee Company is open daily 7a-9p. San Francisco Coffee Company – Thisi Cabo coffee company offers hot and cold brews and has wireless internet. It is located at Boulevard de la Marina #39 L.L. Int. Starbucks – This American chain offers your favorites. You can find Starbucks at Plaza Bonita. Exact location is Blvd. Marina S/N Local 37D Plaza Bonita Mall. Enjoy your frappacinos! Theory Cafe – Theory Cafe offers lattes, mochas and more. Also enjoy free wireless internet!